I got the PCI-E connector from this Ebay seller.. Those SIM holders should be easily available from electronics stores too..
As usual you're the man. Thanks for another well done hack. Is that an HSPA+ 3G modem? I've been eyeing the Sierra Wireless MC8700 lately (supports HSPA+ and UMTS900) but I haven't heard of the MC8755 though. Will this mod work with T91 MT as well? I hate that the manufacturer saves themselves a few pennies and make all of this extra work necessary. It's shameful really. I did just the same thing on my T91MT two days ago, but I'm having problems positioning the antennae. Anyone disassembled the screen bezel on T91 or T91MT? I'm having trouble with the lower part. It seems that there are hidden screws holding it from the back, below the alluminium "Eee PC Touch Series" sticker. Any hint? Great work! It can be switched on/off by software? Nope, that SIM holder is no good. it needs to have 3 + 3 pins.. not in row like on that. Do you recommend mc8775 for anything special? Or another card will work good too? So... a blackberry sim holder will work, right? yep Trihy, that BB SIM holder should work fine. I´d checked on both t91 and t91mt. And t91mt is missing the big square chip at the bottom right from the sim slot. Do you know that is this chip for? If i remember right, it is the SATA controller.. so no need to worry about it.. I think that from a mobility point of view, t91 is unbeatable ATM. Finally Im looking for MC8785V, seems like a good card. Is your next T91 mod a bigger battery? That's what I would be planning if I had one of these. This is a pci-e connector for any pci-e device, correct? if so, could this be used for the Crystal HD Broadcom upgrade? I really feel the video is laggy in Win7 on my T91... I did the runcore upgrade, Class10 SDHC 16gb still seems a bit slow here and there.. zero running in background beyond windows. If I understand correctly, we are using "just" the usb part of the mini pci connector. Not sure if they can lock the usb part to only accept some cards. Don´t know if the broadcom hd use only the usb part of the socket..
Come on Jkk... I'm dyin' for the answer.. Could I do the broadcom upgrade with just a pci-e solder? JKK, when you have some time, please post more pictures, at least one indicating the correct bridges we have to do, Im not really sure if they include one or more points. Well... almost done here :D Still have to find if the white cable bridges two points on the motherboard or its just connected to only one. The picture is not so clear in that part. JKK... are you there? :D I want to close my T91! Trihy, white cable can bridge the 2 points but it is not needed as they are connected on mobo anyway. Still having some problems with the 3g antenna. Underneath a speaker is one possible solution. Anyway... Ill test and report back. There are other mysterious labels on this board like "FM radio", but is missing all components. Well, I got almost everyrhing working. But... I have a problem... sometimes I hear the usb sound like unplugging something, and 3g watcher says "no card found"
That could be because of the 3.3v point... maybe is not giving enough power. And the other thing.. could be the mini pci slot. All solders are tested over and over again, but the socket itself looks too cheap, maybe is not making good contact. Ill try to find another 3.3v point to discard this. Do you know of a good 3.3 source? Nevermind... the mini pci slot is cheap as hell. Im lifting the pins to make better contact with the modem. Everything is working fine, great mod. On a side note, the blackberry sim holder is a little short. If anyone is looking for this, I recommend a nokia sim holder, they are larger and fit better on t91. How to put into Samsung N220? Doese it need to jump the power supply at some point? Do I need the T91MT the connection with the red and white cables? Unfortunately I lifted the pads off the board when I soldered the usb jumpers which go to pin 38. Would you know another spot on the board where I can pickup this point? 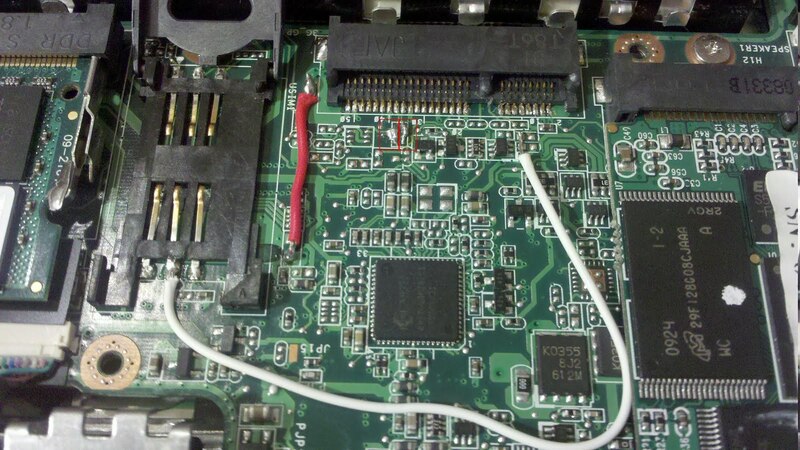 It looks like the USB fuse pads which lifted off were routed to an internal trace. If someone could point me to another spot for this net then I could jumper from that point instead of the non-existant fuse pads. So close but not looking too promising at this point. Need help. Not sure were to solder white wire next to PCI-E connector. There are four soldering points there, and looks like wire is soldered over two of them, or just one of them ??? I have tried to install novatel EU 850D on my acer aspire 722 but my laptop is not detecting the device at all. Can you give me some idea how I can make it to work? Meet:Mobility Podcast 48 – Boring Netbooks?